An option offense can be run out of a variety of formations. As a result, when deciding to run an option based offense, the coach must decide what style of option football he wants to run. With this in mind, there are several popular football formations and schemes being used that feature a different philosophy in how to execute the option. As the coach, you may prefer a “four yards and a cloud of dust” philosophy or you might want to stretch the field with an ability to go vertical as well as horizontal. The first philosophy is better served by the Double Wing or Wishbone set as your base football formation. On the other hand, coaches who are more interested in stretching the field might look to a Spread or Pistol formation. Another popular set, used by BCS teams Georgia Tech and Navy, is known as the Flexbone. 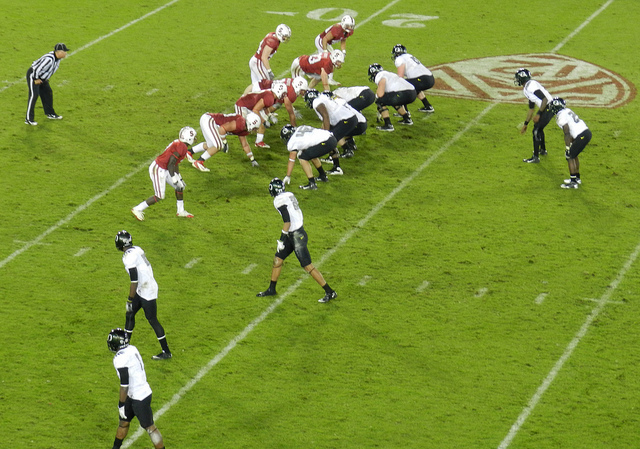 Other common sets used for option football offenses include the Delaware Wing-T, and Pro Style formations like the Split Backs and the I-Formation. Some coaches combine philosophy’s and develop a variety of sets that match the identity they want to set up with their team. The Pistol-Flex and the Pistol-Bone are examples of hybrid sets that are showing up in some programs. While option offenses commonly use the above formations, option schemes work well in many formations. Note: In some places the Flexbone is known as the Spread, the Delaware Wing-T is known as the Single Wing, and Split Backs is known as the Pro Set. Terminology will always change and is subject to place, mentor, and/or other factors.